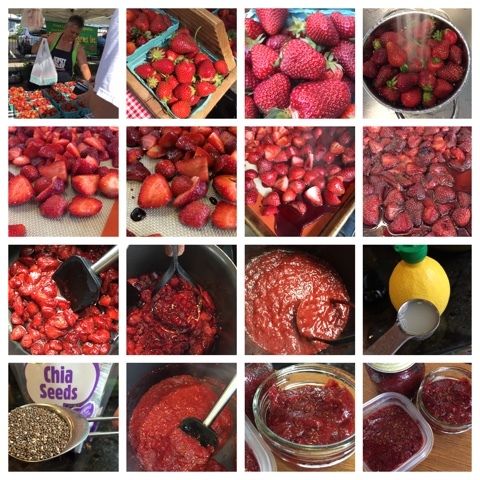 From Farmers' Market to jar in several easy steps - making roasted strawberry chia seed jam is an easy way to savor the best of the spring fruit well into the winter months. With only 4 ingredients and NO ADDED sugar, this strawberry jam recipe is one you can feel good about making, eating and sharing. I suggest that you use only the freshest, most local strawberries you can find, these are the only one's worth preserving and are probably a safer eating choice. Given that the strawberry has topped the list of the "Dirty Thirty" foods/vegetables/fruits I cannot recommend using frozen strawberries or strawberries from the supermarket where they've been trucked in from hundreds of miles away. Get 'em while you can! These gems will only be available for a short time. We hit up the Collingswood Farmers' Market, by biking down early on Saturday, the morning of The Collingswood May Fair, but not early enough apparently as several vendors were already sold out of their ruby gems. I found some from A.T. Buzby Farms and Fruitwood Farms. One of the vendors told me they had sold out by 9 am and had another van-load of strawberry flats brought in for the rest of the morning. Glad I was able to purchase a few quarts. When the weather in these parts goes from a rainy, chilly, 60 degrees one week to blazing hot high 80's, you just don't know how long you'll be able to get these luscious spring fruits. Buy what you can now. Next week they might not be here! Nate couldn't wait to bite into a berry - he ate one as soon as I bought them. I've been wanting to make this jam ever since the winter when I swapped for a jar of it at one of my food swaps with the South Jersey Swappers in Hammonton, NJ. My friend, Amy, made it and told me it was super low in sugar. I asked her for the recipe and was astonished to discover that it has NO ADDED sugar, only the natural sugars in the strawberries. No filter - that's how pretty these strawberries were! To make this into a jam, the natural pectin in the strawberries add to the thickener but with the addition of chia seeds, a serious super food, the gelling qualities in chia seeds thicken the jam up to a perfect consistency. You can jar it into clean containers and keep it for a few weeks in the refrigerator, freeze it for a few months, or can it in a water-bath method. It's up to you and how much you make and how much time you have for processing. Since my batch only yielded about 16 ounces (put up into three containers), I decided not to can the jam. I kept one jar in the refrigerator and froze the other two containers. If I'm lucky enough to be able to buy a flat of strawberries at one of our local farms, then I can do some serious canning. Roasting the strawberries in the oven was an idea I had based on talking with some friends who had made a roasted strawberry ice-cream. That's another recipe idea I'm working on - making it vegan no less - stay tuned for that one soon. In the meantime I thought that roasted the strawberries with balsamic vinegar, a good, thick aged balsamic, would bring out a sweetness and nuance that wouldn't be in the original recipe that my friend, Amy, shared with me from the blog, SuperHealthyKids.com. I always have to make a recipe my own in some small way if I can! Other than using the oven and a tablespoon or two of a good quality balsamic vinegar, you won't need any special tools or techniques. A tablespoon is all you need! Chia seeds can be found a lot of supermarkets these days. My favorite place to buy them is from Aldi. A bag costs less than $3. Best prices I've found anywhere. Use chia seeds in smoothies, oatmeal, over-night oats, in baked goods, in your yogurt, or as a chia seed pudding made with whatever milk you can drink. For the lemon juice, I used a tablespoon of bottled lemon juice. You can use fresh squeezed if you have the lemons. For canning, I prefer to use bottled - it's pasteurized so I know it's safe to use. Three containers, yeilding about 16 ounces. Enough to get me through the summer at least! Hoping to put up jars for the season this week. Enjoy the video montage of how I made the jam, with an apropos music choice to go along with it! Clean the strawberries, rinsing under cold running water, then hull and slice in half. Place strawberries onto a sheet tray lined with either parchment paper or a Silpat. Sprinkle two tablespoons of balsamic vinegar over the strawberries and toss to combine. Roast the strawberries for 30 minutes, stirring occasionally, or until the juices released are thick and syrupy, and the strawberries have reduced in size and look caramelized. Remove strawberries from the oven and put them into a 3 quart sauce pot, scraping all the juices into the pot. Cook the strawberries over medium heat until they break down further. To accelerate the process, smash the strawberries with a potato masher, the back of a wooden spoon, or if your adventurous, puree them with an immersion blender or in a food processor/blender/chopper. Once the strawberries have been mashed to a uniform consistency, add in the tablespoon of chia seeds and the teaspoon of lemon juice and stir to combine. Bring the mixture to a boil for five minutes, then remove from heat and pour into your clean prepared jars. Leave 1/2 inch of headspace in each jar or container if freezing or canning. For refrigerator storage, the jam will keep for up to two weeks. For freezing, leave 1/2 inch headspace, cool thorougly before placing freezer-safe containers not the freezer. Keep frozen until use, for up to 3 months. **To can the jars, follow the directions for a water-based canning method - boiling jam for five minutes then simmering it for another 10 minutes. Pour hot jam into hot, cleaned/sterilized jars, leaving 1/4 inch headspace in each jar. To keep the acidity levels high enough to keep these safe, I usually add in a 1/4 teaspoon of bottled lemon juice to each jar that I'm about to can for each 4-8 ounce jar. If canning in larger jars, such as pints, use a 1/2 teaspoon of lemon juice on top of each jar before sealing. Release air bubbles in jars by sliding a knife into the side of each jar. Wipe jar mouth clean then place lid and screw band onto the jars, tightening until it is finger-tip tight. Place jars into the water-bath and process for 30 minutes. Turn off heat and leave jars in water-bath for 5 minutes, then remove and place jars onto a clean kitchen towel and allow to cool for 12 hours. If any jars did not seal, place that jar into the refrigerator and use the jam within one week. The sealed processed jars can be kept in a cool, dark place for up to one year.